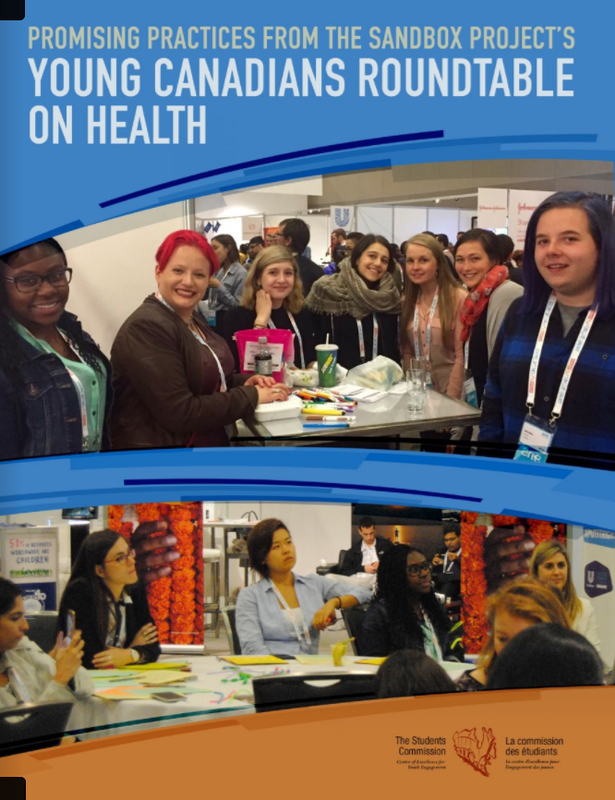 In the fall of 2017, The Sandbox Project partnered with the Centre of Excellence for Youth Engagement at the Students Commission of Canada on a research project to evaluate and reflect on the Young Canadians Roundtable on Health (YCRH) in its fifth year. In order to share our promising practices and lessons learned, the evaluation report was developed into a short youth-adult partnership e-book. As a roundtable advisory, the YCRH is a "living laboratory" that allows for innovation and creativity. YCRH projects range from advising on the youth perspective for health and wellbeing to advocacy for - or in response to - youth health and wellbeing policy, to multi-partnered advocacy campaigns. With over 30 volunteers participating as a network, the YCRH gets its administrative support from the staff at the Sandbox office, but it is primarily youth-run and youth-led. Led by Dr. Heather Ramey, the youth-adult research team analyzed and evaluated the youth-led initiatives of the Young Canadians Roundtable on Health (YCRH) and generated some evidence-based promising practices for youth adult partnerships and youth engagement in the context of health and wellbeing. These findings will help to shape the future direction of the YCRH as a working group within The Sandbox Project’s framework. 1. Raise the bar. Rather than occasionally seeking feedback from youth, work towards providing an ongoing, consistent platform for youth input. 2. Invest in individual relationships. Take the time to build mutual understanding among youth and adults. Whenever possible, meet face-to-face. The more adults understand about the interests and ambitions of individual members, the better youth can be connected to relevant internal and external opportunities. The more access youth have to opportunities in other adult-run organizations, the greater their visibility among decision-makers. 3. Appreciate the value of different forms of knowledge and expertise. Lived experience is expertise that should be valued in the same way as academic knowledge. Regardless of background and experience, mutual respect should be established and clearly understood. 4. Recognize different ways of communicating. When engaging in discussions around new topics, it’s important to properly and succinctly translate knowledge so that it is easily understood and applied by youth and professionals of varying experience. 5. Embrace the unexpected. Both adults and youth should begin with the expectation of mutual respect for everyone's time and efforts. Establishing generous timeframes and agreeing on deadlines at the outset will help you to embrace the unexpected. Adult allies need to be patient and comfortable with the ambiguity of working with youth. 6. Continuously revisit and renegotiate structure and flexibility. The structure, accountability, stability and mentorship that adults can provide are tools that help guide projects along. Every person and project is different. Ongoing communication is key to developing the conditions for youth to do their best work toward achieving their goals.